In what may be the first bit of good news in a while for Northern California, rain could be on the way by the end of this week. It could put the kibosh on the Camp Fire, ending one chapter of the deadliest and most destructive fire in California’s history. Unfortunately it won’t be all good news as the rain could trigger mudslides, hamper search and rescue operations, and make the lives of thousands who are homeless miserable. Fire authorities have made good progress in containing the Camp Fire. As of Monday morning, it was 66 percent contained and fire activity has been “minimal to moderate” as winds that fanned the blaze have died down, according to Cal Fire. A dry summer—already California’s driest season—and a dry start to the rainy season are in part responsible for the fire’s destructive behavior. From September until the fire began in early November, rainfall was five inches below normal. But welcome relief is en route. Major weather models show a series of storms, including an atmospheric river event, will usher in rain and snow to Northern California. The first blast of precipitation could come as early as Tuesday night, but the real rainmaker is expected to arrive on Thanksgiving and last through the weekend in the form of an atmospheric river. Tapping moisture from the tropics, it’s likely to send copious amounts of rain and mountain snow to the area around Paradise, the town basically wiped out by the Camp Fire, as well as points further north into Oregon. In fact, Oregon is likely to get whacked with the brunt of the storm, but the National Weather Service is still calling it a potential “high impact” event across Northern California. Up to 6 inches of rain could fall near Paradise and the surrounding area. That would tamp down flames, allowing firefighters to get an even better handle on containing the Camp Fire. The storm will also come with gusty winds, which should blow smoke out of not just the Paradise area but all of Northern California. That will be a welcome relief for people hundreds of miles from the fire who have been choking on smoke. The rain also comes with downsides, though. Debris flows are among the high impacts that the National Weather Service is forecasting. That could hamper the search and rescue operations that are still ongoing with more than 1,000 people missing and thousands of homes being assessed for damage. A Cal Fire spokesperson told Earther it could clog roads, impeding firefighters’ access to where they need to dig fire lines and assess damage. 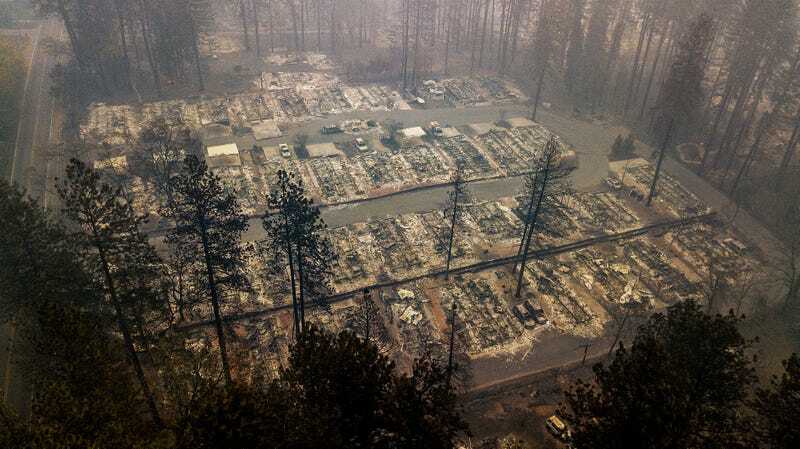 It could also wash away bone fragments and other signs of victims who were essentially cremated by the Camp Fire. Because of that and the already tall task of sifting through ash for signs of human remains, the Butte County sheriff said it’s possible we’ll never know the full toll of the fire. There’s also the concern for the thousands of people who are homeless. An impromptu tent city popped up in a Wal-Mart parking lot in Chico, about 15 miles to the west of Paradise. The rain could swamp the encampment, and organizers are rushing to get people settled into sheltered with roofs that are more solid than tarps and rain flies, according to CNN. A number of shelters have reported outbreaks of norovirus, a highly contagious stomach bug that can cause vomiting and diarrhea. The whole situation may sound like something more familiar in the developing world than the richest nation on the planet, but here we are. It makes clear how the effects of climate change, which has worsened wildfire season, can cascade to create a disaster on top of a disaster. This is a dress rehearsal for the future, one which no amount of raking the forest can stop.